There’s nothing more enriching and satisfying than following your dreams. We’re way past the stage of restricting ourselves to the conventional doctor/lawyer and engineering professions. Now we are all about stand-up comedians, mountaineers and bartenders. With this, we’ve gotten our guide to the fun and the exciting bar tending courses that you can sign up for. STIR Academy of Bartending was set up in 1997 as a platform for people who’re interested in learning about bartending and getting training in the field. It’s run by Shatbhi Basu, the first female bartender in India. The institute pioneers bartenders – with a mix of theoretical and practical knowledge. They have a six to seven month part-time course. It’ll happen three times a week at least and is a three-hour class. The fee is INR 40,000 and once you graduate, there, you’re a certified bartender. A lot of the graduates have gone to open up their own enterprises, have worked at popular bars – including five-star hotels. 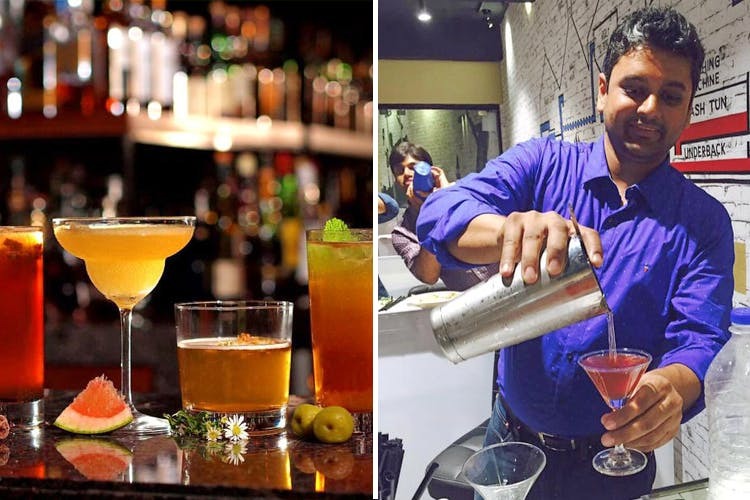 Flairology is another bar school based out of Mumbai and it’s perfect for anyone who’s looking to get a head start in the bar tending field. Here, they have professionals who will be coming in and taking the classes and one-day workshops that happen often. You’ll be learning the methods of combining and mixing drinks, engineering a menu, different styles of cocktails, the latest trends of bartending and much more. They currently offer a standard bartending course for three months and it happens six days a week. The classes last for two hours and the fee is INR 43,000 (inclusive of taxes). Drinq is a bartending academy that is also affiliated with Flaming Trio (the pan-India bartending institute). Co-founded by Binny Dhadwal, the academy offers one-day workshop, passion course, a professional bartending course and a bartending upgrade course. If you’re serious about bartending and want to be a cool bartender flaring shots and mixing drinks at a bar, then we recommend signing up for the professional bartending course. It’s a three-month course which happens three times a week and each class lasts three hours. The fee is INR 34,500 (including taxes). Bonus point – it also includes a one-month on the job training at a popular bar in Mumbai. Think Bar Stock Exchange and the Socials across the city.